Given this density, the effect of removing a block can be dramatic, beautiful and useful. In Topic magazine's city edition, David Haskell's editorial notes the ghostly interior lives laid bare by this punctured structure. Haskell describes an urban archaeology made possible by this coincidental exposure (and particularly the inadvertent collages of tiles, a form of decoration particularly associated with Barcelona). What Haskell highlights most of all is that these ghost traces indicate that these were lived spaces. 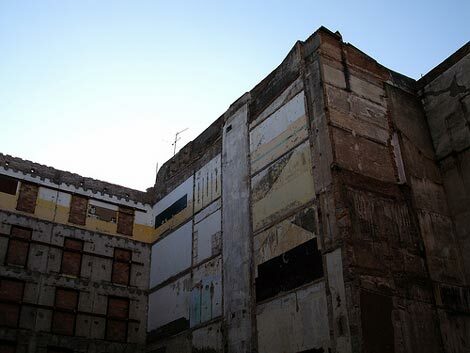 "Carved out of the dense fabric of Barcelona's old city sit pockets of open space in development purgatory. Chances are they won't be there for long, thanks to an aggressive municipal campaign to improve public places, and to a corresponding increase in private market pressures. Their futures uncertain, the pockets presently range from fenced-in construction sites to paved lots perfect for a pickup game of futbol. And as for what used to be there, the past is written on the wall ... Building collages capture an essential paradox of the city: they are, in both senses of the word, vital. They are both delightfully so, and necessarily so. They make Barcelona unexpectedly thrilling, especially for the majority of tourists who will return to a less vibrant hometown. But the collages also testify that Barcelona is essentially lived, not visited - it is at heart a collection of people, with specific needs and desires and ambitions and memories and friendships born of circumstance. ... Gaudi's most valuable gift to Barcelona was not the soaring Sagrada Familia ... rather the example of how a city can modernize while retaining its locality, personality and whimsy." Despite the rising prices in Spain's most expensive city, this is still a genuine mixed-use, mixed-occupancy neighbourhood, and despite Haskell's (possibly valid) concerns about "private market pressures", it continues to be so. So we zoom out from these punched pockets amidst the "vital", lived city blocks, to observe the ancient district itself, full of personality indeed. 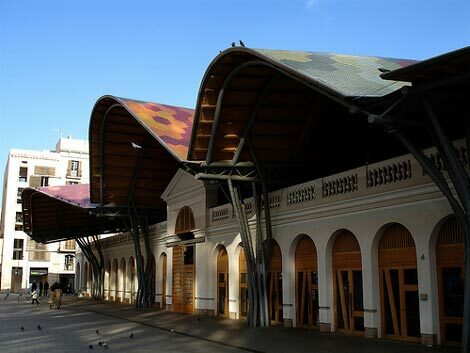 Yet just as Miralles' market isn't simply pure organic development, neither is this city space as essentially unstructured as it might appear. 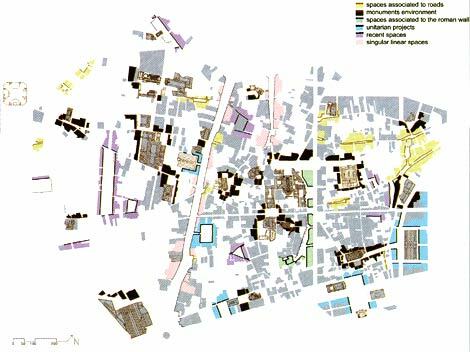 Joan Busquets, in his book Barcelona: Evolution of a Compact City notes that many of these forms and patterns date back to the 13th century (exemplified by, say, Carrer Montcada). There are various clearly articulated theories of urban development back to this time too, especially by Francesc Eiximenis in the late 14th century. 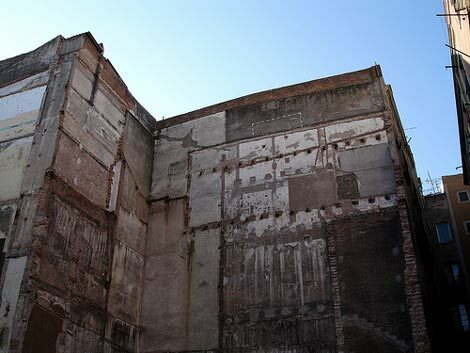 However, when the densification of areas around Santa Caterina and El Raval in the mid-19th century resulted in population levels of 850 inhabitants per hectare, one of the highest in Europe, the tactic of punching holes in the fabric was deployed regularly. Squares and promenades have repeatedly been opened up and knocked through since the 18th century, on a large scale (e.g. 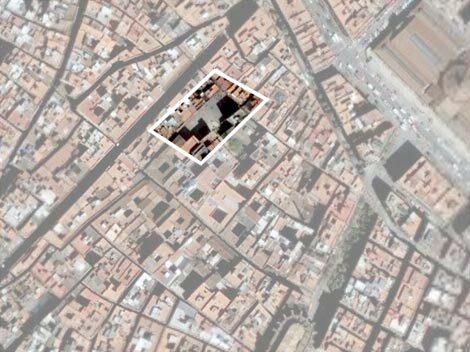 Passeig de Gràcia; Plaça de Sant Jaume; Plaça Reial; ultimately the Cerdà plan, including the Eixample; then Via Laietana) or on the micro-scale of the individual block. 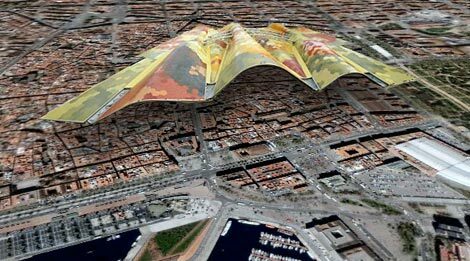 This urban change - a "reform from within" according to Busquets - is fascinating to observe, and to him indicates Barcelona's unique talent for enabling simultaneous development at differing scales, again in an almost fractal sense - from opening up a square up to the special projects of the 1992 Olympics. He sees the last 160 years characterised by constant 'reform from within' tactics, which can be classified simply as streets either opening up, or lines of buildings drawing back, or squares or gardens created by demolishing an urban element, and "very often recycling parts of existing facilities". Given that these last two centuries of modernisation in the old town can be essentially described as "thinning out the compact fabric", it's incredible how dense the place still is. The Ciutat Vella still feels tightly interwoven, and one can only guess that as each new 'breathing-hole' is punched through, another section might fold back in on itself. Creating the Eixample as the locus of development - effectively, a positive distraction - meant that this old centre avoided the tampering suffered by Paris and London. 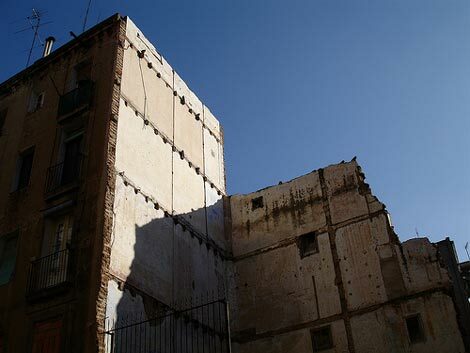 Yet after this virtual abandonment by planning and real-estate sectors in the second half of the 20th century, the Ciutat Vella has retained its relevance. In Busquets' words: "In short, the structural keys of the city once again hinted at a whole body of potential in Ciutat Vella that had been overridden during phases of frenetic development and abuse." So did the form of Ciutat Vella enable an adaptation to change, or did it just lie low until its strategic position was realised? 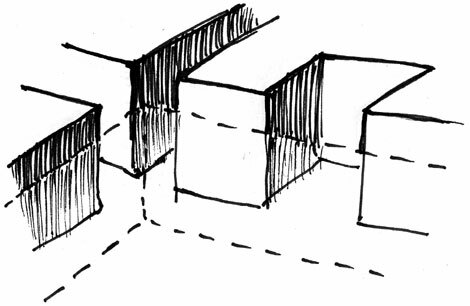 "The rigour of its geometric order has enabled the production of an urban element in which a wide variety of urban uses have been installed with admirable architectural flexibility: the Eixample is an ongoing laboratory of architectures that has room for the most diverse styles and trends, all within the general coordinates of alignment and ground levels established almost from the very start." Absolutely true, and an undoubted prima facie example (ahem) of an adaptive architecture at the urban block scale. However, looking seawards, the adaptability of the earlier Ciutat Vella also gives us pause for thought - that facets of adaptive design might also include a sheer density of architecture, with highly variegated form, within a malleable fabric capable of taking a punch from time to time, recycling itself further within strategically orientated spaces which retain relevance over centuries. The "reform from within" of the Ciutat Vella indicates that this old city will continue to adapt, to roll with its own punches, despite its apparently haphazard, 'whimsical' form. It too presents us with a "laboratory of architectures".